Developed for mid-sized and compact class vehicles. In their issue, Auto Bild (D) has published the ECO Summer Tire Test 2014. The tested tire size was 205/55 R16, the test vehicle a Peugeot 308. 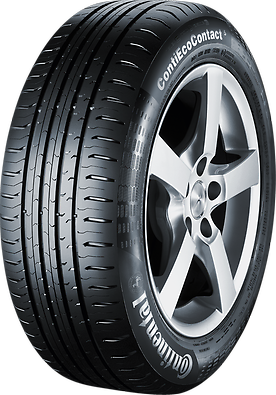 Overall rating for the ContiEcoContactTM 5: "Good"
The German magazine "Gute Fahrt" (D) publishes in its current issue (3/2013) a Summer Tire Test for the tire size 205/55 R16 V. Test vehicle was a VW Touran. The German Consumer Organization "Stiftung Warentest" has published the Summer Tire Test 2012. This state-of-the-art tire is perfect for motorists who drive long distances, as well as drivers who are concerned with fuel consumption and the environment. Exceptional safety and short braking distances on wet roads. The design of the tire improves grip in the wet, giving you safety when braking. 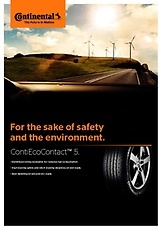 The ContiEcoContact™ 5 is currently a Which? Best Buy for May 2014.